the application fee. If cancellation occurs after seventy-two (72) hours enrollment date no refund will be rendered. student require the courses to be shipped, additional cost will apply. CHRISTIAN MARRIAGE COUNSELING PROGRAM - for FREE! You are only responsible for one-time application fee. 2018 is here, and we have an opportunity for you to finish your educational goals. by which all the awarding of the diploma, certificate, and degrees are conferred. not affiliated with the USDE. application fee is required upon submission. 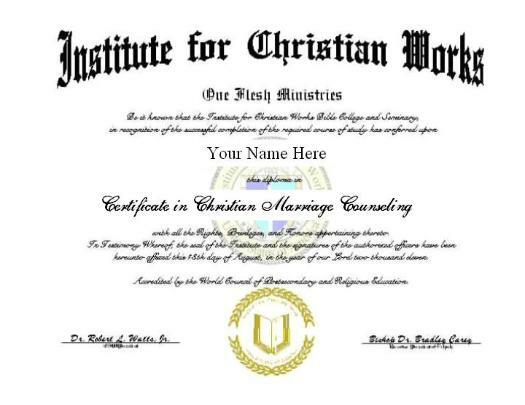 *All ordained ministers received an additional tuition reduction. We thank you again for allowing O.F.M.B.I. to be apart of your PURPOSE!